The saying goes that there are two things in life that a person has complete control over. One being, your attitude. The other, your effort. We all have our own personal goals; a purpose that we strive for. Whether it's to be a good parent, a better Christian, the best spouse, a reliable friend or a successful career... all of which have high standards. Each require an effort. Hard work is the price one must pay to get positive results. With vision and preparation, a dream can become reality. Discipline is the backbone of every success story. There's no way around it. If every obstacle on the course were triumphant, then the one going for the prize was obviously never a contender. Discipline is silent, but very demanding. We all have some degree of the regimen. The trick is to apply it in all aspects of your life to get the full outcome. If you want to be all of the above mentioned, follow through with discipline. Then you can be a good parent, a better Christian, the best spouse, a reliable friend. Most importantly, apply discipline to your work ethic and you will have a successful career. Choose your path. Don't be the type to just let your life unfold. Make things happen in your favor. To obtain a goal, discipline is what will help keep you focused. Hold yourself accountable. If you set your sights for something that you want bad enough, you can achieve anything. It's all about your effort. Achieving a goal requires endurance and sacrifices beyond limitations. A person must have ambition to reach a goal! Nothing in life is easy. At least nothing worth having. Good thing things come to those that work hard and earn it. Success doesn't happen overnight. It calls for dedication, perseverance and a strong desire to prevail. It's not awarded to the weak-minded. Dreaming big and setting life goals allow us to grow. It's okay to take your time. It's also alright to start over. What's not going to get you there is giving up. Success derives from action. As long as you try to improve through consistency and [always] believe in your future, all things are possible. I don't think there is an exact age pertaining to success. It basically happens when a person gets everything to line up right. Say it took you until you're well into your 40's, 50's or even 60's to reap your rewards. That's absolutely fine! If you hit that mark early in your life or later, either one. As long as you make it happen. When you can finally stop in your tracks, look back over your life and smile at your accomplishments is when you know you've reached your point. Derek Rooney, from Orange County, New York came into his 20's on a mission to succeed. He was bit by the "trucking bug" at an early age. Derek witnessed firsthand the type of labor and real work needed in trucking from his father, who drove a tractor trailer as an owner operator for a living. Derek jokes, "When I was a kid and realized the value of a dollar, I became a little hustler." During his childhood, being raised around trucks by a positive role model, he was able to get a head start in many ways. "The equipment, the people my dad associated with, and the fact his name was recognized out there made me proud. I wanted all of it too," he says. Reflecting back on some of his earliest memories, Derek can remember the sound of his father's truck coming down the road. Recalling the excitement as a four year old boy, ready to run out of the house to see his dad in his big ol' truck, as if it were yesterday. By age seven, Derek was riding in the front seat on his dad's lap with his hands on the wheel. Memories such as these paved the way for Derek's future. He was very driven as a teenager. After saving enough allowance, he bought himself a lawn mower at 13 and (literally) ran the wheels off of it. In between time, he played baseball with friends, but nothing could preoccupy him from wanting to work. He says, "I loved working hard. Still do! That was my hobby. I wanted to be successful and feel accomplished... just like my dad." Out of high school, Derek continued various landscaping and warehouse jobs. He always knew that he eventually wanted to be out on his own though. Completely focused on his future, he kept progressing in hopes of purchasing a truck. "I already knew that I didn't want to attend college. Since I was very young, all I wanted to do was fulfill my dreams of getting my own truck," he states. At the age of 16, right before his senior year he landed a job at a local truck wash. Unable to drive the trucks yet, he figured he would find another way to be around them. "I wanted to know more about them. Learn everything I could and just stare at them," he said. For five years, Derek stayed at the truck wash working his way up to a supervisor position. By 19, he got his permit and hopped in the truck with his dad every chance he had. Again, just taking in his surroundings. Absorbing any and all information pertaining to trucks. Unfortunately, his father suffered a stroke which left him with no vision. Derek seized the opportunity to help his father and began driving for the two of them full-time. For about eight months, Derek drove with his dad gaining more experience with each trip out. 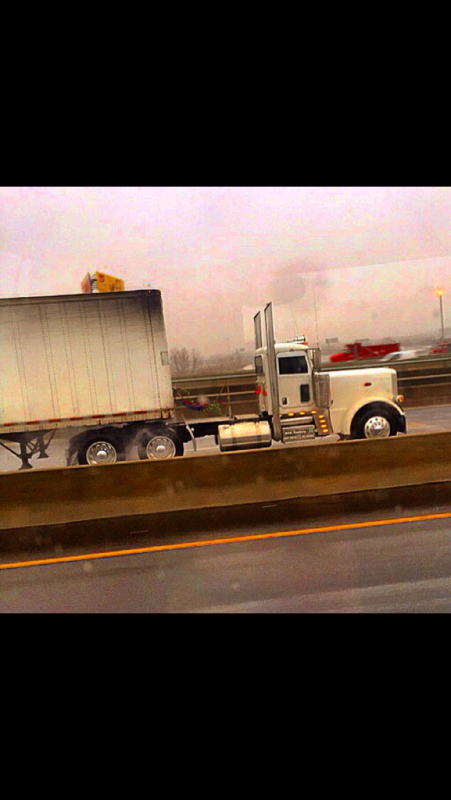 Once Derek had a taste of the freedom from trucking, he quickly grew tired of working for other people. He was ready to leave behind stationary gigs, being stuck inside of buildings. When he had enough money put back and the chance to go out on his own, he planned on taking the risk as soon as possible. He had been ready to jump into it for as long as he could remember. His chance had come in 2011, he purchased his first truck. It was a white 2005 International 8600 Daycab. Immediately after, he leased to A & K Trucking. A company based out of Accord, New York. Today, Derek is in his own tractor and trailer with over 250,000 safe miles to his name. He's home every night, running primarily the northeast area for A & K Trucking. 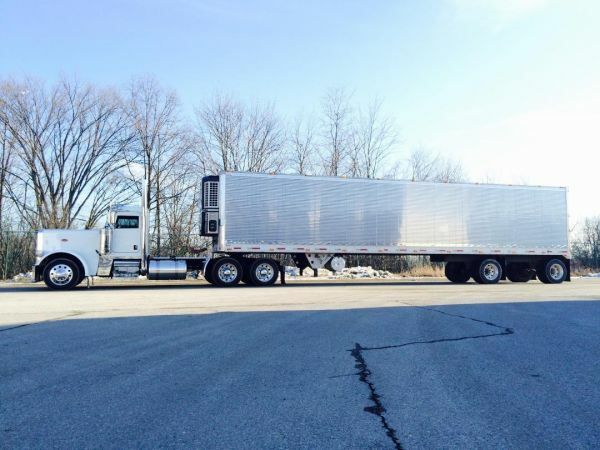 His goal as an owner operator is to eventually increase his fleet. With A & K Trucking, they allow him to branch out. That being the main reason he has remained with the same trucking company for four years. He says, "I know that with no risk, there are no rewards. I don't mind taking those chances. I love the freedom that comes with it all. 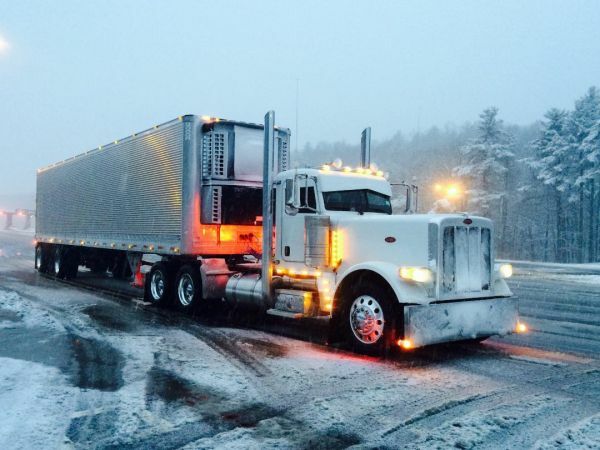 In trucking, it's amazing what you can do in a day's time. I feel as if I'm living my dream every day!" 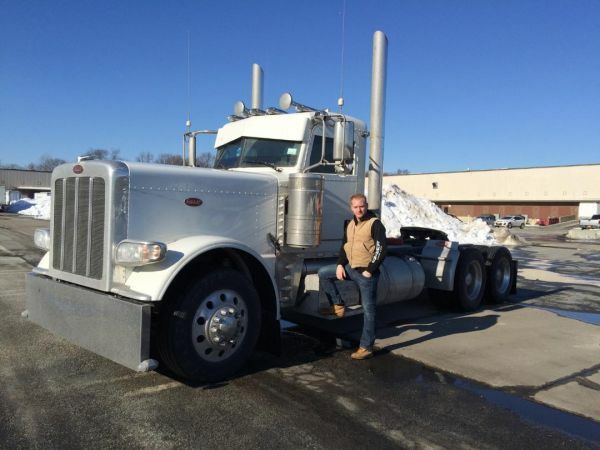 This past June, Derek sold his International and purchased a brand new 2014 Fitzgerald 389 Peterbilt Glider Kit. It's also white with a Detroit 535 Engine, 13-speed transmission and 3.55 rears. When he's on the road, his favorite thing is getting to meet new people and seeing different places. But above all, catching up with people that knew his father and having them acknowledge his success as a professional truck driver, just as his father had led the way, is what reminds him that he has finally reached his dream. Sadly, his father passed away on Father's Day last year. Derek keeps his legacy alive through trucking. Everything he does, he does in honor of his hero. He displays his hard work, his leadership and his go-getter mentality on a daily basis. For two years, Derek has been a club member of Chi-Town Large Cars, the East Coast Chapter. Knowing that there are truck drivers similar to himself that he can share the same interests with is what initially appealed to him. "The fact that people can always use some positive support in facing whatever challenges they're going through is a huge part of what Chi-Town Large Cars is known for," he says. Based out of Chicago, Chi-Town Large Cars is a non-profit organization formed by truck drivers to help impact people's lives from all around the world. The 10 year old club, with 150 active members throughout 3 countries put together fundraisers, benefits, and truck shows to raise awareness of childhood cancer. As well as, money to donate to families in need. Derek says, "I've always been a team player and I enjoy helping others. There is no better way to reach people than through our club. We've built our organization on the core principles of respect, loyalty and trust. And I know that through the strong friendships that I've made with each club member that we're way more than just a truck club. We share a bond that money can't buy."